Dr. Chuck Posternack joins Tecport Vision as Chairman, as the company prepares for Canadian launch of patented medical device approved for the treatment of migraine headaches by Health Canada. 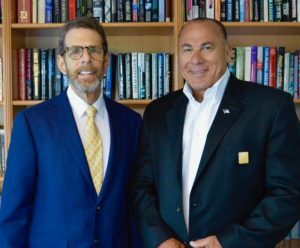 Orlando, Florida, April 2, 2018: TecPort Vision has announced the appointment of Dr. Chuck Posternack as its Chairman. Dr. Posternack joins the Tecport team as the company lays the groundwork for the Canadian market introduction of the first patented, clinically validated medical device for the treatment of migraines. “As a licensed Canadian and US physician with more than 36 years of clinical and business experience across multiple disciplines, both in the US and abroad, we are excited to have Dr. Posternack lead our effort to bring to market the first non-invasive medical device proven to help migraine sufferers,” said Dr. El-Hag, Co-Chairman and Managing director of TecPort Vision. “I am honored to have the opportunity to work side-by-side with Dr. El-Hag on this game-changing innovation in migraine treatment. There are more than 400 million migraine sufferers world-wide, many of whom suffer debilitating side effects from the drugs commonly used to mitigate their symptoms. I am excited to be part the team who will be leading the introduction of an optical device that is both affordable and essentially without medical risk, and that can bring virtually immediate and lasting relief to patients,” said Dr. Posternack. Throughout his 30-year career in the healthcare industry, Dr. Posternack has held multiple senior executive and academic medical positions, including Chief Medical Officer of Promise and Success Healthcare System, Associate Dean of Academic Affairs, Schmidt College of Medicine at Florida Atlantic University in Boca Raton, Chief Medical Officer of Boca Raton Regional Hospital, and Chair of Medicine at the Cleveland Clinic in Florida. Throughout his career, he led or was part of teams that substantially grew operating revenues as well as excelled in the areas of quality and patient satisfaction. Dr. Posternack received his Doctor of Medicine degree from McGill University in Montreal, Quebec, Canada. His track record as an innovator in collaborative care and industry partnerships have established him as a cutting-edge business leader in the medical industry. He has won many prestigious awards including “Excellence in Medical Education,” given by the South Florida Business News; one of the “Top 500 Physicians in the USA” by Town & Country; and “Best Doctors in America” by Woodward and White. Tecport Vision is a wholly owned subsidiary of Tecport Optics.